It's been 11 years since I was diagnosed with eczema (skin allergy). For the past 10 years I thought I was allergic to shell seafood, hence I quitted shell seafood for 10 good years. During this period, allergic still strikes quite often. I thought it was due to weather and stress. Until last year (2013), I happened to stumble upon this clinic in Tangkak that was said to be a skin specialist. I decided to give it a try because my allergy had gone worse. Now even my lips starts to peel on and off but I have no idea what causes it. A closer look of my lips. Doctor Wong is a skin specialist but he is different. He has a unique way of testing allergens. 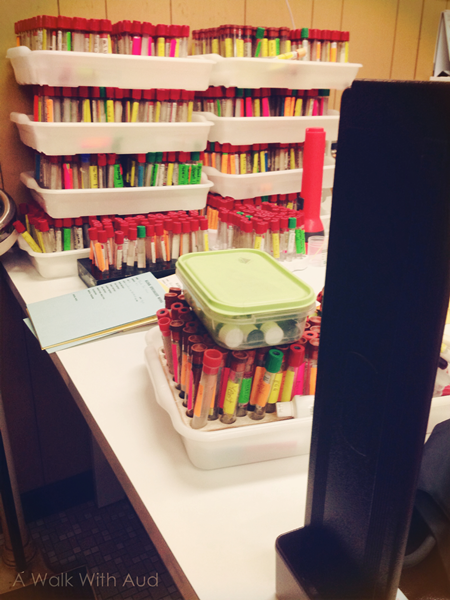 In his diagnose room, there are tons of test tubes on his desk. Each test tube contains different source of allergens and each source has a scale of 0-30 allergy levels. The higher the more serious your allergic is. 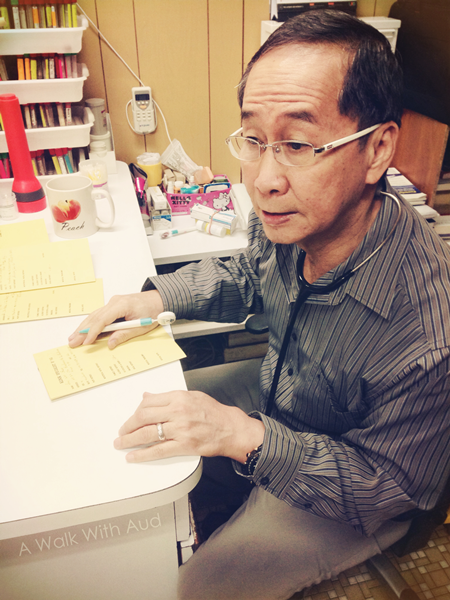 Here, the friendly Doctor Wong. He is a Hainanese by the way. 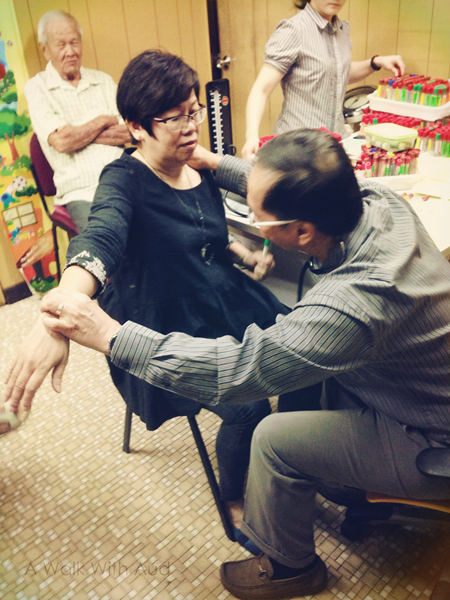 Doctor Wong practises Muscle Kinetic (Applied Kinesiology) to detect allergies. You grab a test tube (containing a suspect allergen, example egg) on one hand, and raise your other hand. Use your strength to maintain the position, Doctor will then tries to push your raised hand down. If you are allergic to egg, your muscle will be weak and you will not have the strength to resist the doctor's push; but if you are not allergic to it, you will not have problem maintaining your hand up. Sounds skeptical? Indeed there are debates over the method but I've tested myself. I am allergic to egg (level 23) and yeast (level 24). It's been a year since I stopped eating eggs and yeast, my allergies level to egg and yeast have dropped to 11. 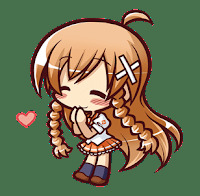 Doctor Wong says that allergy can be cured, as long as I bring down the allergy level to 0 and maintain 0 for a year so that body will have the time to build up immune system, after that you will be all fine. It's not that easy in my case as egg is too common in post processed food, but still I am trying my best to avoid it. You may be doubtful over it's accuracy but I believe it must have helped many or else it won't be so crowded everyday! 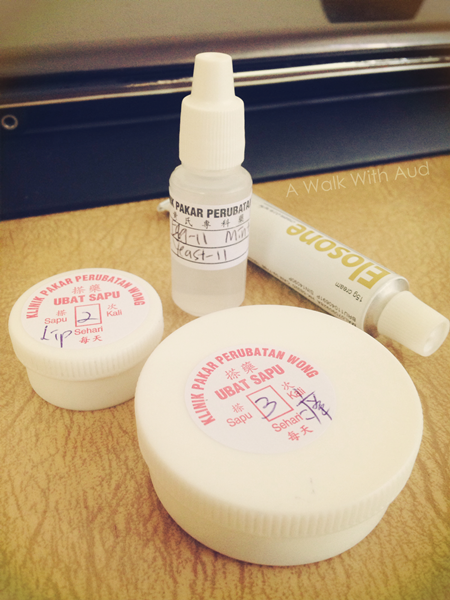 The medicine I got from Doctor Wong costed me RM330 for 2 months perscription. Erm, it's not cheap. Make sure you bring enough cash if you decided to give it a try. This visit, I found myself allergic to mint. Doctor says, from now on use only kodomo toothpaste. I was like, you gotta be kidding me! This is new! I was fine with mint in the past why out of sudden? He says that if you don't cure your allergies to A, New allergies B, C, D will come sooner or later. The allergen will change throughout time, the best is to build up your immune system. To whoever that has allergic, I hope you find this article useful and maybe get yours cured. I am still working to cure mine. 114, Jalan Payamas, 84900 Tangkak, Johor. Hi, I would like to follow-up if you have been cured of your allergy? the medicine - Elosone - is steroid cream. How long do you use it for? 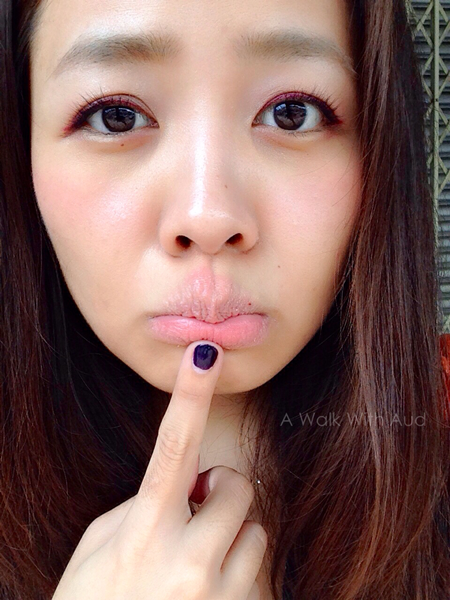 I am also having repetitive allergy on my lips, just like you! After i apply steroid cream, it will always heal but the allergy will return in a weeks time. Really appreciate if you could tell me more about Dr. Wong. hi there. I only apply the cream until my lips heal. I rarely have lips allergy now unless I accidentally taken food with high dose mint (small dosage is fine now) which cause my lips to peel. Can he cure acne problem? I believe yea. My cousin has bad acne problem, his acne now is so much better and he looks better now! How's your allergy to egg now? I'm having food allergy to which is very tough for me. Hello, I am still having allergy to egg. I try my best to avoid all egg stuff but sometimes it's quite difficult as egg has many post processed food. But so far, I find that as long as I avoid eating those obvious egg food, my allergy is under control. 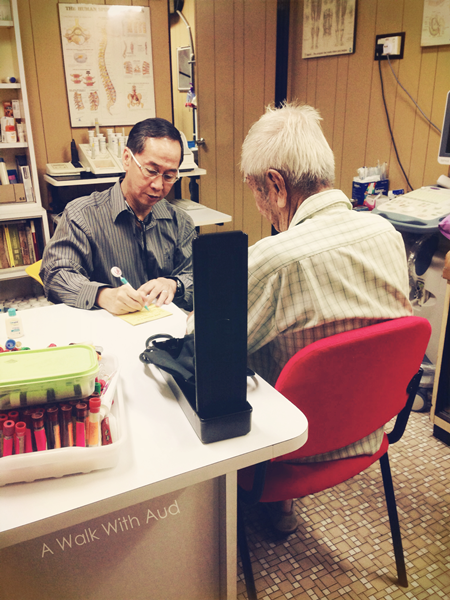 Hi Audrey, I visit Dr Wong last Saturday. I am allergy to yeast level 30. Any example of food to avoid? Hi Pauline, wow! your yeast level is higher than mine! For yeast, it's easier than egg. avoid all beard including chinese pao, you tiao etc. Oh and no beer. Always check the label on the food packaging, those with yeast, don't get it. You will find yeast in some biscuit, instant noodles, etc. but if it says raising agent, it is still in the acceptable range. can he cure psoriasis problem ? Hi Honey, that I am not too sure. Maybe you can try give it a call to check before heading over. Hi Lester, indeed. I've done quite a few read up before I went to visit the doctor. But I proceed in the end with the mind of having a last hope. So far, it works! I started taking bread again since a few months back, and I am having them almost everyday now. No more allergy! That's a really good news to me! Next will be egg! Hopefully it will be back on my eating list again! Hi, You can't make appointment. It's by first come first serve basis. I am from Melbourne. I suffer from hayfever, bad especially after golf. 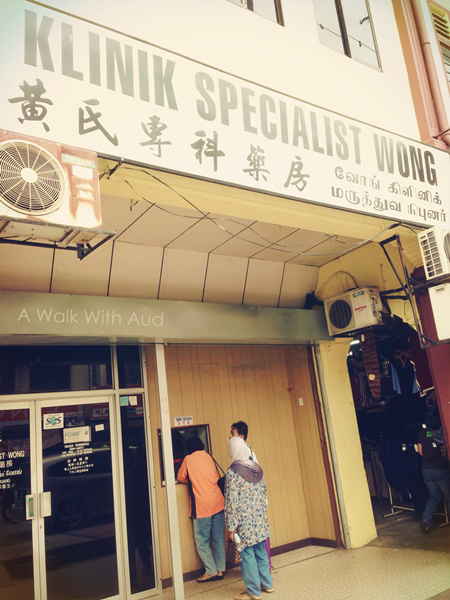 Stumbled onto Dr Wong during my holiday in Msia last month. The vodoo drop he gave cured my sneezing & stuffy nose instantly. I am back in Melb now and its still working. Goodbye to Telfast. Wow! That's great for you! How did you stumbled upon Dr Wong? Hi Peter, it was in 2014. I can eat bread without problem now. Occasionally egg but not too much, I will still have allergies if I consume too much eggs. Hope this helps!